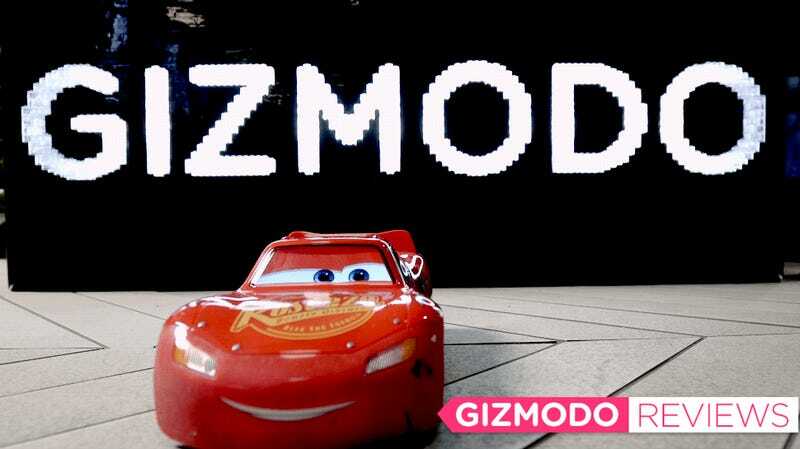 I might be the only person at Gizmodo that likes Sphero’s new Cars toy. My co-workers hate the way the robot announces it’s going to sleep, and the long animated process it takes to wake up. They’re also horrified by the very existence of sentient automobiles and tractors that moo. But my colleagues are too caught up in trying to understand Pixar’s Cars world to realize that they’re playing with the incredible future of robotic toys. Back in 2011, Sphero (then, Orbotix) debuted a smartphone-controlled robot ball that only seemed useful as a way to harass your cat. In 2015, the same technology was used to create a rolling Star Wars BB-8 toy that became a massive hit, and led to Sphero’s newest creation: a remarkably lifelike remote control version of Cars’ Lightning McQueen. With a third movie hitting theaters soon, there will large audience for Pixar’s Cars franchise so this Lightning makes an obvious choice for the next bot toy from Sphero. (Though, I’m holding on hope that Pixar’s adorable WALL•E will get its own robotic toy in the future.) Growing up outside of Detroit, I also automatically inherited an appreciation for horsepower, and the original Cars is still one of my favorite Pixar films. Should the car’s headlights actually be their eyes? I disagree. Using their large windshields as eyes gives the Car’s characters more room for expression, which Sphero has managed to perfectly recreate here. Even if you’re not a fan of the films, it’s hard not to be impressed by Sphero’s ode to them, and the technology that powers it. The first thing you notice about McQueen is the toy’s heft. The car feels as sturdy as something Tonka would make, but that weight doesn’t come from die-cast steel. Packed inside McQueen are six (surprisingly quiet) motors used for steering, driving, and controlling Lightning’s expressive movements. There’s also a speaker box in there, a rechargeable battery good for about 40 minutes of driving, and a trapezoid-shaped LCD screen under the windshield used to animate the character’s eyes. Sphero says its engineers worked with Pixar animators and directors to help ensure the toy moves just like the CG character in the Cars films. I’m certainly no expert in what it takes to anthropomorphize a car, but the combination of the LCD eyes, moving bumper mouth, and animated suspension genuinely help this toy feel almost alive.—that and the hundreds of different phrases it speaks, voiced by an almost perfect Owen Wilson sound-alike. Sphero’s Ultimate Lightning McQueen also comes packed with sensors, including light, motion, and touch panels on the roof, hood, doors, and rear of the vehicle, so that as kids play with it, the toy is aware of how it’s being handled, and can respond accordingly. Should McQueen be involved in a rollover, the toy will ask for help in getting back on its wheels, and if your colleague viciously shakes it because they’re too disturbed by it’s existence, it will shout in alarm. Besides being an excellent robot approximation of a Pixar character, McQueen is also a full-on remote-controlled car, but driving him around can be a mix of fun and frustration. The car’s front tires are made of grippy rubber, while the back wheels are made from a smoother material that allows the vehicle to exaggeratedly drift as it turns. And as McQueen is cornering, the motorized suspension makes the toy realistically bank and lean into the turns. It genuinely adds a lot of fun to the driving experience—if you can get Lightning to go where you want him to. The toy’s app makes that difficult. 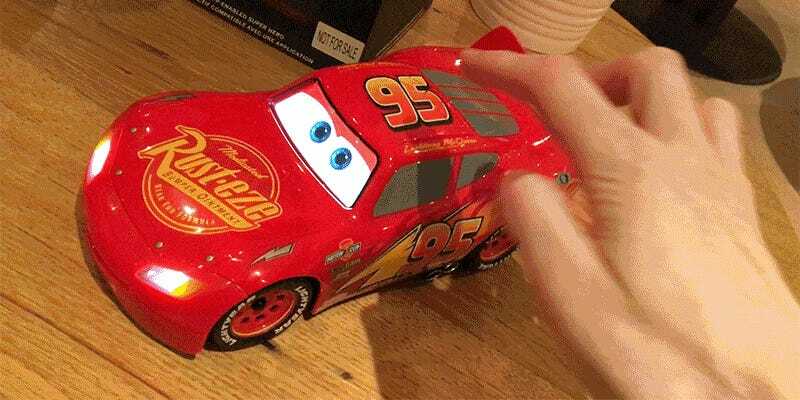 As with all of Sphero’s products, Lightning McQueen is controlled using a free app for iOS or Android. That approach works relatively well when you’re driving a perfect sphere that can move in any direction, but it proves frustrating with a car. When using a physical controller, steering to the right always causes an RC toy to turn to its right. But the virtual joystick in the Lightning McQueen app works differently. You essentially move it to tell the car where you want it go in a room, and the car does all of the steering itself to get there. So pulling down on the joystick doesn’t cause Lightning to reverse, it instead causes the car to turn around and drive back towards you. If you played with a lot of RC cars as a kid (or are lucky enough to play with them for a living as an adult) these controls will feel counterintuitive. With enough practice your brain eventually clues in, and you’ll be able to drive Lightning around a room. 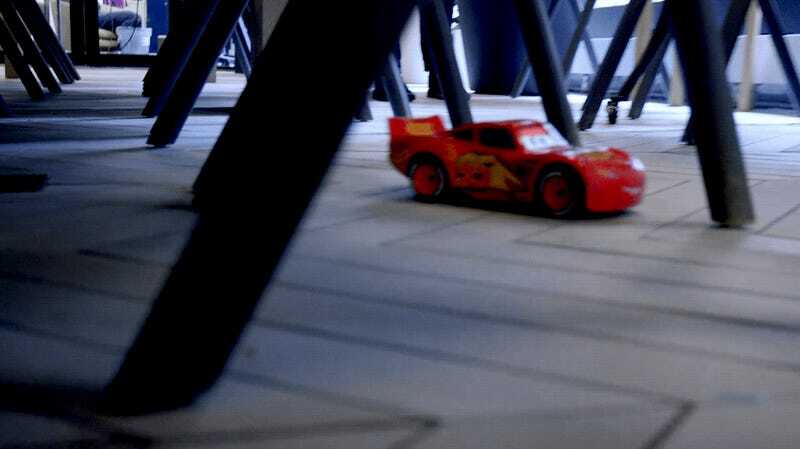 But because the toy itself is still handling all of the steering, McQueen will occasionally crash into obstacles as it turns around to change directions. Still, the driving difficulties don’t detract from the rest of the highly-polished iOS/Android app that includes additional racing-themed games, the ability for McQueen to watch and react to the first two Cars films, and a basic programming interface for customizing the toy’s movements and actions. With a $300 price point that’s double what Sphero’s BB-8 cost, there probably won’t be quite as many kids able to convince their parents to buy them an Ultimate Lightning McQueen. But price tag and driving challenges aside, Sphero has shown that a robotic toy packed full of lifelike features doesn’t necessarily have to look like just another robot. If this is the future of toys, it’s as good a reason as any to start having kids. Ultimate Lightning Queen moves, drives, and sounds just like the animated character. The free accompanying app expands the toy’s replay value, and allows for easy over-the-air updates and added features in the future when connected to wi-fi. Sadly, McQueen uses a proprietary connector for charging, instead of microUSB. A $300 RC car should really include a physical controller, or at least offer one as an accessory. Ultimate Lightning McQueen’s unique touchscreen controls are a pain. At any point the vehicle can be manually pushed around by a child, thanks to clever engineering that ensures the drive motors won’t get damaged. 40 minutes of drive time per charge is impressive. Video shot by Carmen Hilbert; Produced and Edited by Eleanor Fye; Car driven by Mike Nuñez.